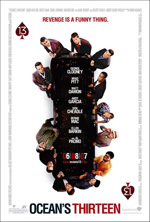 What did you think of Ocean's Thirteen? This is the first movie all year that I have been really excited for, that has actually delivered. I haven’t been this happy when leaving the theater since…Lucky Number Slevin. It was funny. It had heart. Best of all, it was truly entertaining. We find our cast of characters called back together because Reuben (Elliott Gould) has suffered a heart attack after being double-crossed. Loyalty and friendship prevail and the team launches an attack on Willy Bank, played by Al Pacino. The best part about this movie is that all the characters are back. Every actor that was part of the original team is back. Without that, it wouldn’t have been the same. Speaking of the actors, no one has better on-screen chemistry than George Clooney and Brad Pitt. Not a single one of their former co-stars (including Angelina Jolie and Jennifer Lopez) has ever had the kind of easy, natural interaction on screen together. The cast of side characters is back as well, with Andy Garcia’s Terry Benedict and Eddie Izzard’s Roman Nagel as part of the team. Together they pull off a heist not for the money, but for justice and vindication of the good guy. The heist, and their methods, are just as unbelievable as the first two movies, yet you believe it all the way. The casino that Willy Bank built is incredible. It must be completely CGI on the outside, since that hotel obviously doesn’t exist in Vegas. It’s a beautiful helix design that would actually work very well in Vegas. The inside of the hotel/casino is beautiful too. That’s another thing I loved about this movie, and the first one – you feel the Vegas excitement just from watching. That’s how authentic the sets and background action are. There’s not much I can tell you about the plot since most plot points would give away surprises. I will say that a few other characters from previous movies will pop up. If you really must know, click the spoiler link below. Toulour, the thief from Ocean’s Twelve that the team outsmarted, as well as Linus’ Dad. Overall, absolutely worth the price of a movie ticket, plus the popcorn & soda, plus the Milk Duds I would have bought if I hadn’t caught at 10am showing. Plus Milk Duds for the person behind me in line. Go see it now.